RECON® provides our customers competent services and consulting for the sourcing of Reconditioned Engines and Components. 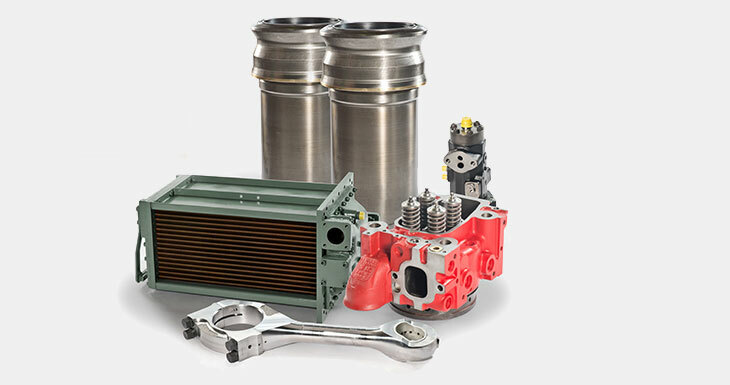 Aside from reconditioned engines for stationary and marine power and energy systems, we also supply oil coolers, water pumps, injection pumps, turbochargers, cylinder blocks, cylinder heads and pistons of all well-known producers. Large stock of exchange parts such as cylinder blocks, oil coolers, water pumps, turbochargers, cylinder heads, camshafts, injection pumps, pistons etc. for diesel and gas engines for brands like Deutz, MWM, MAN, MAK, Jenbacher, Cummins, Scania, Waukesha and others. Delivery with a classification certificate, e.g. GL, LRS, DNN, ABS, etc. In our company all engine components are reconditioned professionally and precisely according to the manufacturer's specifications. You are able to download our current stocklist here. At the shops below you will finde a wide choice of engines, components an spare parts and with just one click they are already on their way to you. Take a look around.